This exhibition features fiber artists Jane Bartlett, Betty Busby, Anne M. Fischer, Valerie Goodwin, Susan Martin Maffei and Nelda Warkentin. Yvonne’s vision to create a network of quilt artists who would pool their resources to support and expand the reach of quilt art was realized in 1989 with 50 artists throughout the United States. SAQA has since broadened into a 3500+ member international organization that continually works to fulfill her vision. 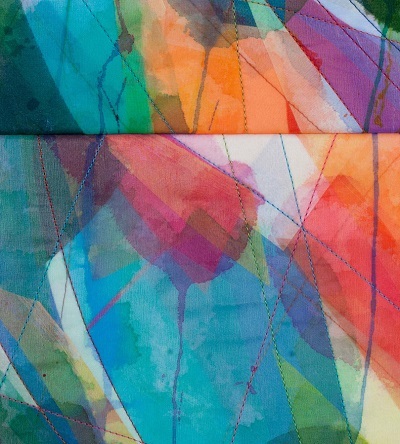 Here are more award- winners from AQS QuiltWeek Phoenix 2016. The Nickel Plate Arts February exhibit puts a sense-of-place spin on our annual Love, Lust and Poetry exhibition. In honor of Indiana’s bicentennial, this year’s “Valentine’s” exhibit features works that depict what artists love about the Hoosier state. The Hoosier Heart-Land exhibit is meant to serve as a visual love letter to our state, commemorating the people, places and things that make Indiana what it is today. Our goal is to create an exhibit that can lift up your spirits on even the coldest, dreariest of February days and encourage you to marvel at what a complex, vibrant place Indiana has become over the past 200 years. You are currently viewing the archives for February, 2016 at Woodhaven Studio's Weblog.